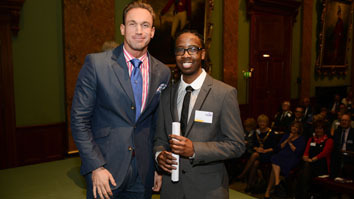 Dane's commendation was presented to him by TV broadcaster Dr Christian Jessen at the event held at Fishmongers Hall, London Bridge. Dane who is in his final year of his pre-registration Adult Nursing course at LSBU also had the privilege of meeting Her Royal Highness The Princess Royal, who was guest of honour. Her Royal Highness is President of the Edith Cavell Centenary Appeal which is aiming to double the number of beneficiaries which the national nurses' charity currently supports by October 2015. The Princess Royal said she was proud to be President of the charity's centenary appeal, adding: "The Trust feels this is an appropriate time to allow us to invest even more in the future of our young nurses and midwives. It is an entirely worthwhile aim of this kind of event which raises the profile of these young people." The Cavell Nurses' Trust established in 1917 in memory of Edith Cavell provides financial support to 650,000 student, working and retired nurses, midwives and healthcare assistants after they have experienced a range of difficulties. For more information about the Cavell Nurses' Trust visit their website. To find out more about the School of Health and Social Care and the courses on offer please see the course finder.